In 2017, the last year of the Barack Hussein lunatic spending spree that was never budgeted, El Salvador received $118 million in US foreign aid, Guatemala received $257 million, and Honduras received $181 million, a total of $556 million, over half a billion dollars in charity for countries that are lifting nary a finger to stop the formation of huge caravans of their own people from forming and traveling unimpeded through their countries to cross illegally into Mexico and ultimately to attempt to cross illegally into the United States, where their goal is to surrender to US authorities who will have to release them into the country, unable to keep them due to ridiculous US laws limiting their detention. The overcrowding of detention facilities requires the parasites be released to make room for more parasites who will, in turn, be released into the country as new parasites cross illegally into the United States, who surrender and are sent to detention facilities, awaiting an asylum court date that comes and goes with the parasites never appearing, having disappeared into the country to perhaps collect welfare or work illegally as day laborers, paid under the table. Many are criminals, gang members, human traffickers, drug runners. They see the United States as the big Santa Claus where all their dreams will come true just by showing up. No effort, no loyalty, no assimilation, just being trucked through Mexico by leftist financiers, waving the flags of their native countries, and perfectly willing to stick their middle fingers into the faces of We the People, challenging us to stop them, because they know that liberal politicians have screwed America up beyond recognition and they can and will be treated better than American citizens. All they have to do is touch American soil. And, who do we have to thank for this mess? Democrats in Congress who are preventing the funding of the wall that will keep the parasites out. The policy has now been changed, requiring that Mexico house and feed the nomadic parasites while their ridiculous asylum claims make it through the overwhelmed US judicial system. I have an idea, Mexico. Why not load these people onto buses and haul them back to their native countries. Then, prevent their crossing the Suchiate River, which they have had no trouble wading across. Far less burdened by the political correctness that plagues the United States, be forceful in a lethal way, if necessary. But, DO NOT let them in! The people of Guatemala, Honduras, and El Salvador must take their own countries back. Being cowards does not give you a right to invade America and demand that We the People house you, feed you, provide you with free healthcare, and educate your children who cannot speak English, which, believe it or not, is the language of the United States. YOU must solve your problems at home instead of thoughtlessly becoming problems to someone else. 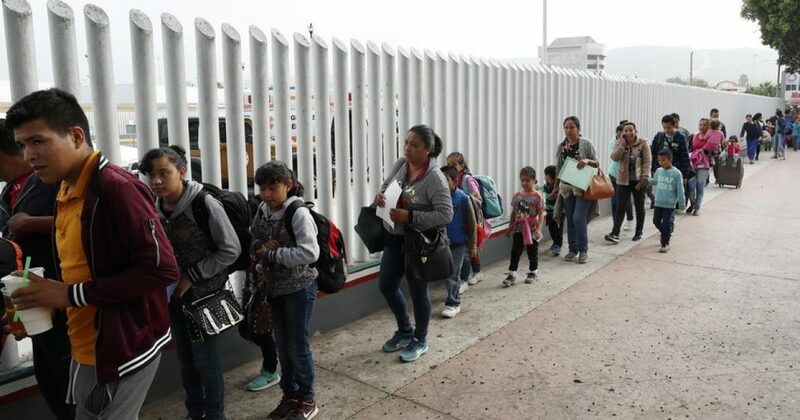 Let this sink in – we are paying countries who are invading us $556 million a year to send us their most indigent, most downtrodden, least productive citizens to invade our country. Hey, I know! Let’s put that $556 million directly into the wall budget. Let’s add the DOD savings for the withdrawal from Syria. While we are at it, let’s get out of Iraq and use that money also to fund the wall. In addition, let’s add the money we are saving by keeping the government shut down. Heck, the shutdown is going so well, let’s make it permanent. BOOM! We now have so much surplus cash, we can not only build an awesome wall on our southern border, we can also build an awesome wall on the Canadian border. It is time to put America first! I apologize for my habitual use of the invective in responding to the tweets of liberal weenies who aren’t smart enough to tie their shoes, but, honestly, the stupidity of the left is overwhelming. I simply can’t take it anymore. I don’t know how else to speak to them. Logic is useless, common sense is useless, history is useless. They are like a continuous loop of the worst of CNN and MSNBC, brainless zombies. Well done! These parasites need to grow a pair and take their countries back instead of coming to the US and forcing us to take care of them. The RNC pays for all campaign related travel. Find something else to cry about. It's pretty funny when a liberal whines about government waste. His private plane is 10x better. He gives up his salary and donates it every quarter. NO president has EVER done that! No. We are going to build a wall with it, stupid! He threatened it then, he is doing it now. What part of that don't you get? Hey, stupid, those countries are expending ZERO effort to stop caravans now. That's the point. You didn't know that? It's OK, someone has to ride the short bus.